Black Death or the Bubonic Plague? In the Elizabethan era there was pestilence and repeated outbreaks of the Bubonic plague (Black Death) and these were not just confined to highly populated towns such as London. The country area and villages were not exempt from the disease either - there was no hiding place. Information regarding the handling of the Bubonic plague (Black Death), symptoms, medical treatment and cure used during the Elizabethan era are fully described below. Black Death or Bubonic Plague? The workers depicted in the picture are the death cart labourers and the watchman. The following description and information about their roles will clarify the significance of the picture and the consequences and its relationship with the Bubonic plague (Black Death). Watchmen were allocated to watch the ' plague houses ' and the only means of sustenance was for the victims to lower baskets from an upper window for the watchman to put food into it. Plague Pits were rapidly dug. These pits were approximately 20 feet deep - the width of the pit would continue to be extended as the outbreak of the Bubonic plague (Black Death) spread. A consequence of continued outbreaks was that even old Plague Pits were re-opened. The death cart labourers generally undertook their gruesome work at night and the bodies were hurried out of the house wrapped in any kind of improvised shroud. The Elizabethan Watchmen and the death cart labourers were, not surprisingly, very well paid. But their gruesome job entitled them to receive a good supply of alcohol. Their jobs were clearly life-threatening and there was a high mortality rate. There was no town cleansing department in the Elizabethan era. Month after month people were employed in this work, which became more and more difficult to accomplish as the plague spread and carried off one after another of the workers. When, despite the high wages, no new men for this job could be found women and boys, especially those who had recovered from the Bubonic plague (Black Death), were forced to carry out this work. Threats of imprisonment were made as encouragement to undertake these tasks and this consequence was suffered by anyone who refused the role. In later years houses containing victims were sometimes indicated with a red cross painted on the door with the words "God have Mercy". The red cross acted as a warning as there was a time when the victims of the illness were not carried away to be buried or burnt. The same deadly labour shortage continued until a medieval Physician had the idea was that the disease would be better contained by not throwing the bodies into the streets and into the approximation of other people. These corpses were left rotting in the houses until they were dragged out, weeks later, to be thrown on a cart and finally disposed of. Due to the food shortages and closure of businesses those who were not struck down by the Bubonic plague (Black Death) often resorted to stealing from the dead bodies. The penalties for this were varied and severe. 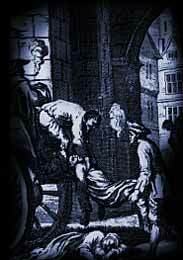 Many such thieves were thrown into the pits, dead or alive, with their victims. There was nowhere to hide from the disease and no one was safe, not even the monarch. Queen Elizabeth was terrified of the disease and implemented quarantine measures to try to ensure the safety of herself and her courtiers. When the Black Death ( Bubonic Plague ) broke out in London in 1563, Queen Elizabeth I moved her court to Windsor Castle where she erected gallows and ordered that anyone coming from London was to be hanged - so great was the fear of the plague and avoiding any spread of it to her court. Queen Elizabeth I also prohibited the import of foreign goods as a measure to prevent the spread of the disease to the Elizabethan court. There were three very serious outbreaks of the disease which led to the closure of all places of Elizabethan entertainment, including the Globe Theater. These occurred in 1593 , 1603 and 1608. The impact of closure must have been extremely frightening, not to mention the threat of the Black Death ( Bubonic Plague ) itself. There would have been no money coming into Theater companies and therefore no money for the Elizabethan actors. It would not have been certain when it would be safe for Theaters to re-open. And there would have been the constant fear of contacting the Black Death ( Bubonic Plague ) or seeing friends and family dying from the deadly disease. The Elizabethan era was truly a dangerous time. The spread of the disease continued. The symptoms associated with the disease were, and are, painful swellings (bubos) of the lymph nodes. These swellings, symptoms of the deadly plague, would appear in the armpits, legs, neck, or groin. Victims also suffered a very high fever, delirium, the victim begins to vomit, muscular pains, bleeding in the lungs and mental disorientation. The illness also produced in the victim an intense desire to sleep, which, if yielded to, quickly proved fatal. It was no wonder that the Black Death or Bubonic Plague was so feared by the people of the Elizabethan era. The Elizabethan churches administered to the Black Death (Bubonic Plague) victims but very little other help was given and food was rarely distributed. Only the very wealthy would receive the ministrations of an Elizabethan Physician who would have received an education at one of the Universities. There were Elizabethan surgeons, but these had a similar reputation to the barbers and the usual route that most people took was to visit the apothecary, or dispenser of drugs. The ' wise women ' in the Elizabethan community or some members of the Church were really the victims only hope for a medical treatment and cure of the Black Death or the Bubonic Plague. Any pictures of Physicians of the Elizabethan era look very strange and quite frightening. Elizabethan Physicians adopted protective costumes against the disease in the 16th century. Elizabethan Physicians wore long dark robes with pointed hoods, leather gloves, boots, and the most bizarre masks featuring long beaks which were filled with bergamot oil. Amulets of dried blood and ground-up toads were worn at the waists of the Elizabethan Physicians. It was their custom to douse themselves with vinegar and chew angelica before approaching a victim. Although this might sound pointless today, these precautions would have protected the Elizabethan Physician. The bizarre and gruesome Physician masks would have acted as protection against contracting the disease through breathing the same air as the victim. The cover-all clothing would have protected the Elizabethan Physician from fleas and therefore the Black Death / Bubonic Plague. In the Elizabethan era various concoctions of herbs were given and used for the medical treatment of different parts of the body and the varying symptoms of the disease. Elizabethan medical treatment for head pains was with sweet-smelling herbs such as rose, lavender, sage, and bay. Medical treatment for stomach pains and sickness was with wormwood, mint, and balm. Lung problems given the medical treatment of liquorice and comfrey. Vinegar was widely used as a cleansing agent as it was believed that it would kill disease. Bloodletting, or cutting open the vein nearest the infected part of the body, was commonly thought to be one of the best ways to treat the illness. The blood that exuded was black, thick and vile smelling with a greenish scum mixed in it. The Bubonic plague (Black Death) was the greatest fear of people living during the Elizabethan era from the Queen herself to the lowliest of her subjects.